Members of the Central American migrant caravan move to the next town at dawn on November 02, 2018 in Matias Romero, Mexico. In the days since the midterms, the migrant caravan traveling from Central America towards the U.S.-Mexico border has largely dropped out of the headlines and the president’s tweets, as discussing the caravan’s progress has momentarily ceased to be an effective fear-mongering and vote-grabbing tactic. But thousands of exhausted and desperate people are still traveling through Mexico and will soon be arriving at our southern border. (The first group—comprising largely LGBT people who’d splintered off from the main caravan and traveled at a faster pace—arrived Tuesday, in fact). And those people, both the ones who’ve already arrived and the thousands still to come, will need practical, immediate, direct forms of help and solidarity. Kathryn Johnson is the Policy Advocacy Coordinator at the American Friends Service Committee, a social justice organization founded by Quaker peace activists in 1917 to aid the civilian victims of World War I. They’ve continued doing on-the-ground work without a pause ever since, including supporting the civil rights movements and campaigning for the abolition of nuclear weapons in the wake of the Hiroshima and Nagasaki atomic bombings. Johnson recently spent time traveling with a portion of the migrant caravan, a group of about 2,300 people who’d originated in El Salvador and hoped to reach the United States. We talked to her soon after she arrived back in Washington DC about what she saw and what direct forms of aid people in the United States can offer. Our conversation has been lightly edited for clarity. JEZEBEL: How long have you been with AFSC? When did you decide you’d travel down to meet the caravan? Where did you start? Kathryn Johnson: I’ve been there for three years almost exactly. I started thinking about traveling down to Mexico basically right away. I work specifically on advocacy around US immigration policy and US policy towards Latin America, especially with a focus on migration, because that’s what our programs are mostly in the region. So as soon as we heard about it, I hoped to make it down there. There’s so much going on here with immigration—our other big campaign is about appropriation and trying to eliminate funding for CBP and ICE—so it’s hard to get away. But i felt like this was an important moment. I also have a background in human rights accompaniment, when I lived in Guatemala. For the last seven years [before joining AFSC], I was here in DC doing advocacy with the Guatemala Human Rights Commission, on human rights and US policy in Guatemala. Can you talk about what “accompaniment” is? Accompaniment is—well, so often the presence of folks of more privilege, especially Americans, can really prevent human rights abuses. I definitely saw that. I spent three of the days I was down there traveling with the caravan that was more Salvadorans. And we saw the difference in how authorities, especially immigration authorities, treated the migrants when we were present versus when we weren’t. That’s part of it, being a visible presence with our vests, we’re very visibly there. But then part of it isn’t just your eyes, but [acting as] the eyes of a broader audience. That’s what’s nice about AFSC, is getting that info out when there are abuses or, on the flip side, when there’s incredible solidarity and generosity both on the part of governmental sources and private organizations like churches. Can you describe the scene when you arrived? When I got to Mexico City, the first big group was slowly arriving at the stadium, the Estadio Jesús Martínez. That was like the second day that the big caravan was arriving. So I saw the operations as civil society organizations and governmental institutions were setting up and starting to receive migrants. That was some of the groups who were providing legal information about the refugee and asylum systems in both the United States and Mexico, so people know their options. From there, I traveled down to Chiapas and met up with the Salvadoran caravan there. The estimates I saw were that there were about 2,300 people [in that group] by then. And so I traveled with them from Huixtla, Chiapas into Ixtapec, Oaxaca. How did the Salvadoran portion of the caravan seem? What was their mood? People were exhausted. At that point they’d been traveling for a couple weeks, a mixture of walking and getting rides. For all the groups, crossing the border from Guatemala into Mexico was terrifying and really hard on them because of the repression there. A lot of them were still recovering from that terror and the physical violence they faced at the border. They crossed the Suchiate river, and normally that river, there’s a bridge over the top of it which is the official border crossing. That’s where the photos of thousands of people on that bridge came from. But then down below there’s free passage on the river in inner tube rafts, and people go back and forth all the time even as they’ve militarized the border. It’s hard to imagine unless you see it. So while many people in the earlier caravans had tried to cross at the bridge and been rebuffed, [this group] crossed the river. But the military and immigration authorities and police stopped the rafts. So they just swam or most of them pulled each other across. 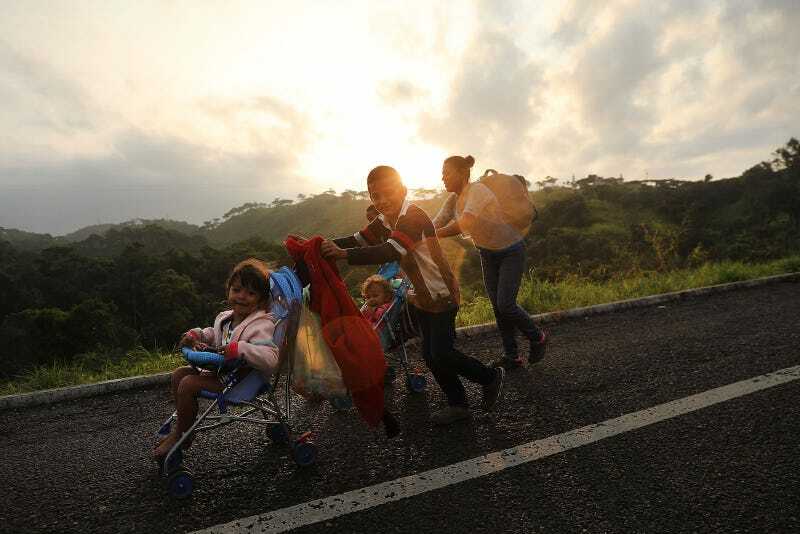 There were about 100 children in this particular caravan, so a smaller proportion than earlier caravans, but still children and infants as young as four months old. So they pushed their way across while they were being teargassed. They were luckier. The one before them, one that was more mixed but mostly Honduran, that crossed a couple days before, they were shot at with rubber bullets and one young man died. So they rested a little bit more and took it more slowly in the beginning in Chiapas ... But there were some who wanted to catch up with the next caravan to have strength in numbers, so they traveled much faster. They’d start traveling between 3 and 3:30 every morning with instructions of where to stop midday and then where to stop that evening. So we’d start off our accompaniment by seeing who was left behind—who was too sick or injured to travel—or even wanted to be returned. The Mexican government had offered voluntary return, but we saw they weren’t complying with that. People were turning themselves in voluntarily to be returned to their home countries but immigration was saying no. This is all in Chiapas specifically. They were leaving because there’s no way to support themselves. They want to help their families. How much opportunity did you have to talk to people as they were traveling? All day. We weren’t walking with them, as they were getting rides. We had a car so we’d travel with them and then stop when we found smaller groups, check in, see what they needed. We were in constant contact with municipal authorities and the Red Cross and then with human rights groups in the area. What kind of medical issues were you seeing? So many people had blisters and other injuries on their feet. But the amazing thing was that municipal health authorities were there at every stop, doctors from the city, along with these two nuns who traveled along them at every stop and other nonprofits too. So there was medical help for treating people’s feet, because that’s the kind of thing that can get infected and be terrible. We also saw a lot of dehydration and stomach infections, and then there were a lot of respiratory infections, especially in children. What did they talk about leaving behind in El Salvador? Poverty. Poverty. That’s what everyone talked about. They were leaving because there’s no way to support themselves. They want to help their families. I talked to so many people who had children back home or wanted to help their mothers and fathers and brothers and sisters. Were they aware of what a politicized issue their travel was becoming in the United States, the president tweeting about them threateningly? Very specific things reached them: that they were sending troops and his comment that anybody who picked up a rock would be shot. I had many people ask me if that was true. I said it was true that he said that, and that unfortunately Customs and Border Patrol already does that and has killed numerous people with impunity at the border for that very thing, because they said they were throwing rocks. I also said that troops theoretically under law can’t do immigration enforcement. But I tried to be very careful not to try to make any guesses about what would happen at the border. I asked people what they thought would happen, but besides strict factual information about what I know about US policy and law or past practice, I didn’t try to warn people or provide any future predictions. Most people were trying to reach the US border? Absolutely. In the south most people didn’t have much information about the Mexican asylum system even though there was a big operation in the capital. There are organizations who provide that information in the south, but they didn’t have the capacity to reach everyone with that. But yes. Almost everybody I talked to was interested in reaching the US or at least the border. People said things like, “It’s in God’s hands,” or, “We hope to change Trump’s heart,” or, “We hope to negotiate with Trump.” That’s what I kept hearing over and over again. And what did they think would happen there? They had no idea. Which for me was fascinating. I kept thinking that somebody had some inkling or a plan or a vision. People said things like, “It’s in God’s hands,” or, “We hope to change Trump’s heart,” or, “We hope to negotiate with Trump.” That’s what I kept hearing over and over again. Well, in some ways that makes sense. It’s been amazing, the power in numbers. Despite not being specifically organized by anybody, I would still call it a movement, and, to this point, a somewhat successful movement for their right to migrate. They’ve successfully negotiated with local and federal government officials, in this case first in El Salvador, then Guatemala, then Mexico. So it makes sense they have hope that they can do something similar [at the US border]. I was in the stadium yesterday and that was more of a mixed group, but primarily Hondurans. People kept saying, “We just want to go there for a little bit and then we’ll go home, we have families back home. Maybe if he just told us how many years we could be there for work and then we’ll go home? Just tell us.” That was sort the idea. They’re hoping for some sort of temporary status. And what I kept thinking was that they showing such courage. Having no idea what’s in front of them, they’re just moving forward on hope and on the power of being together. And we as Americans have to stand with them. We have to show that same courage. What do you think is going to happen when most people reach the southern border? I don’t want to speculate. Were you surprised that the caravan largely dropped out of the news after the midterms? No. Trump’s reaction to the caravan was all about the elections and that was clear from the very beginning. Every response—his rhetorical responses and his policy responses—was playing to an electoral base. And that was clear from the very beginning. And I—I wish that they had just waited. Just for their sake. Yeah. And I’m glad they’re arriving at the border after the elections. Because I think the mobilization of the border, the militarization, was just an electoral ploy. But I’m worried it’ll come back into the news because of appropriations. Like right now—the resolution doesn’t end until December 7, is our understanding, but right now is the key moment for negotiations at the leadership level for all of DHS funding, especially CBP and ICE, as well as for detention bed levels. Right now, they’re about 5,000 people per night over what ICE actually has funding for. They’ve tried to use multiple tricks throughout the year to increase that funding, some successful and some not. They reprogrammed $100 million from other parts of DHS including nearly $10 million from FEMA during hurricane season. We’re also expecting an announcement from DOD [the US Department of Defense] that they will themselves with their own money be building immigration detention facilities. Had people you talked to heard about family separation? Was that a concern for them? I didn’t ask anybody specifically about that. I talked to one young man, I’m not sure how old he was, but barely an adult, I would say. He was traveling with his nephew who was a minor, 12 years old. They wanted to go home and turn themselves in in Mexico. He decided not to, because he asked if he’d be separated from his nephew, and the people I was with who focus on immigration issues in Mexico said yes. I don’t know if he knew about that because he knew about Mexico or had heard about the US policy. What I saw were kind, sweet people who were incredibly grateful for the support they’d been given along the route and just want to work to support their families and live without being in terror. It would’ve been a good question. Right. But I actually don’t know how you ask that question without potentially creating a panic or leading people to think their kids are definitely going to be taken, given that the separation policy has theoretically been rolled back. Also, in terms of being able to provide good information. The official family separation policy has ended but there’s been all these rumors about a family separation 2.0. [Ed note: Trump has said he is considering such a policy.] I don’t want to provide any speculation to people, so I was careful. I would be worried that my question would be leading. So, how can we help? What do people need? We’re collecting donations at AFSC. I have to mention that first. We’ll be providing humanitarian support. Several high level people from my organization have been down there the last few days … several of them were in Mexico City with me evaluating needs and we’re raising funds to meet humanitarian needs. We’re not sure of everything yet, but one of the big needs we certainly heard is that the shelters are overwhelmed all along the route. They were before the caravan came and now they’re even more overwhelmed. We met with various shelters and shelter networks, so we’re providing some assistance there. And there’s mobilization in the US. Again, I think people are going to make a stand at the border of some sort. People in the caravan, you mean? Yes. I don’t think it’ll be violent. It’ll be a nonviolent visible deliberate presence by the caravan. And we feel like it’s important that there’s an American presence standing with them at the border. We don’t know when that’ll be, but now that I’m back I need to loop back in with the organizations who are evaluating that. But I think it needs to be a long-term presence. It can’t be a single day or a single protest. They’ll be there long-term. The wait at the Tijuana port of entry or the San Ysidro entry is already over 2,000 people applying for asylum and they’re already only letting in between 20 and 100 people per day who are specifically applying for asylum. Tourists and other things pass through all the time. There’s already an amazing effort going on in Tijuana and they’ve dealt with huge populations there before, like the 20,000 Haitians who came in 2016 and they were at the Tijuana port of entry for a while. So they have shelters there, but then if the shelters become overwhelmed they’ll move people into churches and if the churches become overwhelmed they’ll move people into auditoriums and other spaces. But people will need food and clothing. People are cold already and come from hot climates. People have been providing clothes all along the route, but there’ll be needs there, along with medicines and a need for volunteers. I have to ask this: Trump was claiming without any evidence there were “Middle Easterners” and implied terrorists in the caravan. Did you see anything that would have caused you to believe that was in any way true? No. What I saw were kind, sweet people who were incredibly grateful for the support they’d been given along the route and just want to work to support their families and live without being in terror. I saw families and people on crutches and people in wheelchairs. We saw very low incidences of violence within the caravan, despite it being a bunch of people who’d never met before. Probably lower than we see in DC every day. Besides donating money, what are other ways we can help at home? Shelters along the border are calling for volunteers, and there are other actions you can take today. But also we have a pledge that we’ve done with an interfaith coalition for people who want to take different kinds of actions, and we’ll be contacting them for how to mobilize how at the border.